Courtesy of Orbit US, Julia Knight’s SWORDS AND SCOUNDRELS and LEGENDS AND LIARS. Courtesy of Orbit UK, Louisa Hall’s SPEAK. Courtesy of Tor Books, Anne M. Pilsworth’s FATHOMLESS and David Drake’s AIR AND DARKNESS. Courtesy of Titan Books, Charlie Jane Anders’ ALL THE BIRDS IN THE SKY. 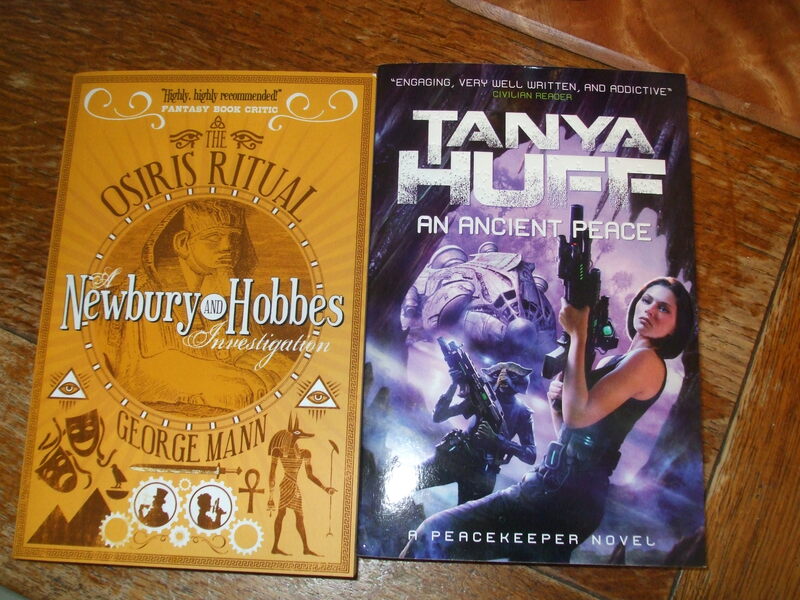 Courtesy of Titan Books, Tanya Huff’s AN ANCIENT PEACE, and George Mann’s THE OSIRIS RITUAL. 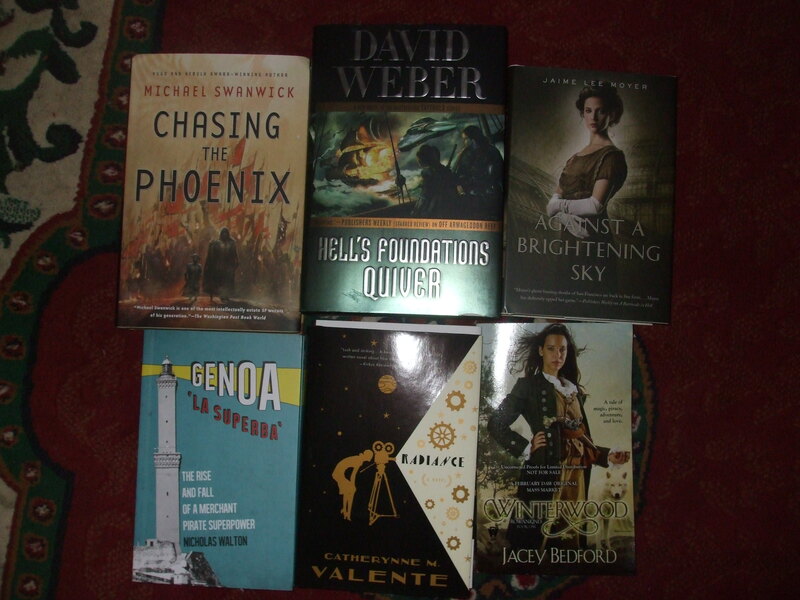 Here we have courtesy of Tor: Michael Swanwick, CHASING THE PHOENIX, David Weber, HELL’S FOUNDATIONS QUIVER, Jaime Lee Moyer, AGAINST A BRIGHTENING SKY, and Catherynne M. Valente’s RADIANCE. Courtesy of DAW, we have Jacey Bedford’s WINTERWOOD. And courtesy of Oxford University Press, Nicholas Walton’s GENOA LA SUPERBA: THE RISE AND FALL OF A MERCHANT PIRATE SUPERPOWER. There is a new postbloke on our route. 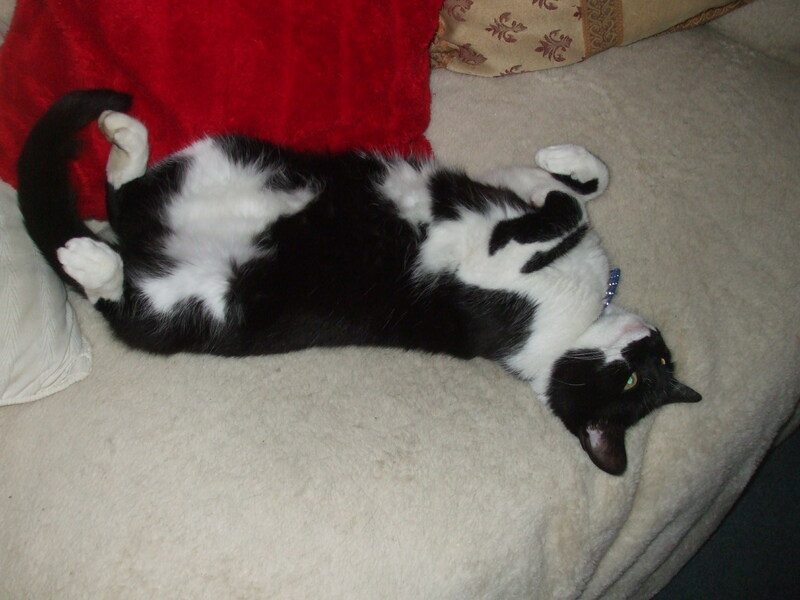 This morning he rang the door at 0830. I thought I dreamed it, until I woke up properly and discovered the “we missed you, please collect your parcel” inside the letterbox. 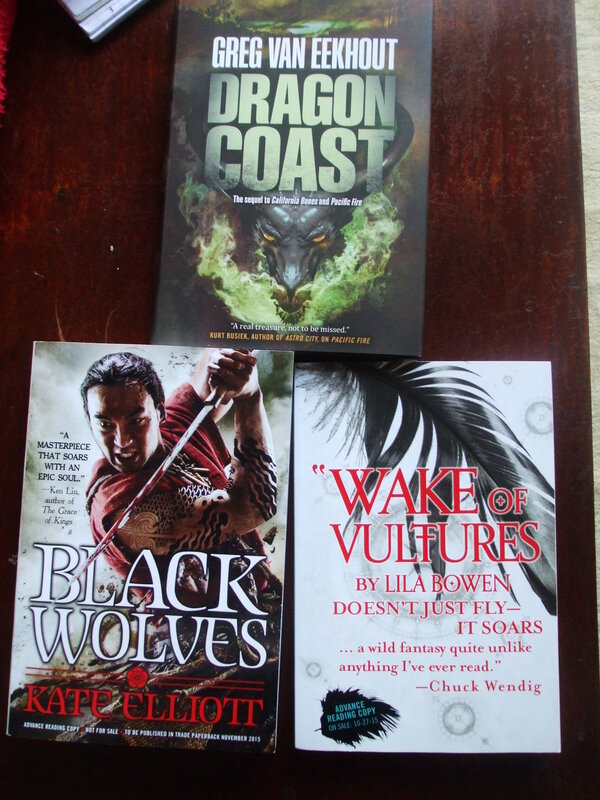 That’s Greg van Eekhout’s DRAGON COAST, courtesy of Tor Books. Courtesy of Orbit, Kate Elliott’s BLACK WOLVES (woo!) and Lila Bowen’s WAKE OF VULTURES. 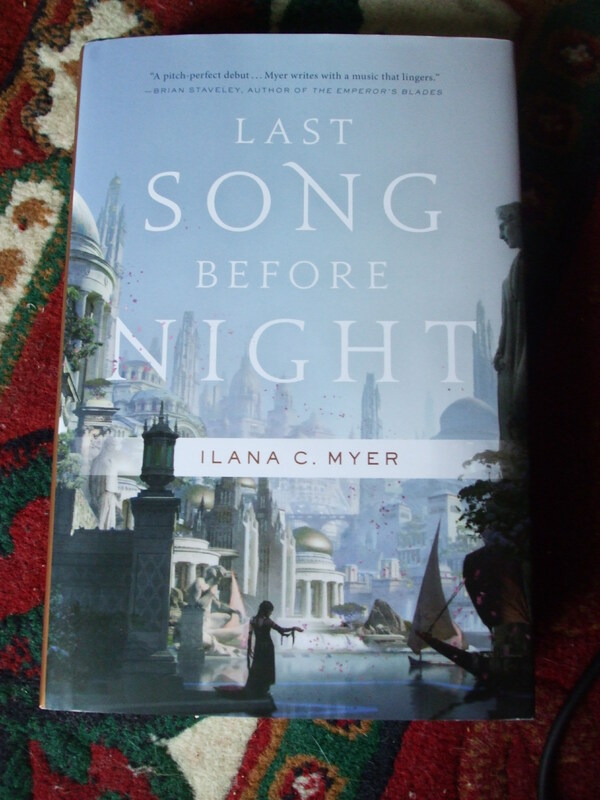 And here, courtesy of Tor Books, is a finished copy of Ilana C. Myers’ LAST SONG BEFORE NIGHT. Courtesy of Oxford University Press, two anthologies of travel writing: AN ISTANBUL ANTHOLOGY and A NILE ANTHOLOGY. Also Helena Michie and Robyn Warhol, LOVE AMONG THE ARCHIVES: WRITING THE LIVES OF SIR GEORGE SCHARF, VICTORIAN BACHELOR. 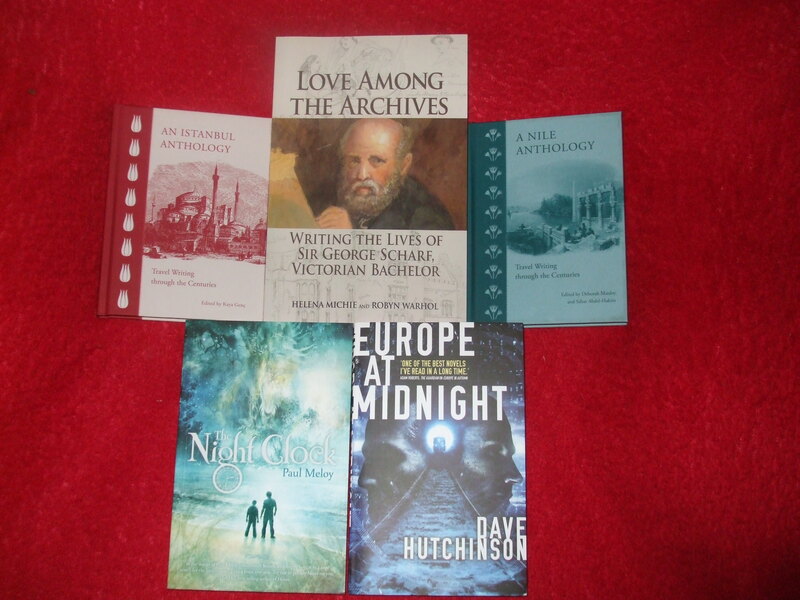 Courtesy of Solaris: Paul Meloy, THE NIGHT CLOCK, and Dave Hutchinson, EUROPE AT MIDNIGHT. Terrible photography AND unimpressed cat, aren’t you lucky? Courtesy of Oxford University Press, that’s Ulf Schmidt’s SECRET SCIENCE: A CENTURY OF POISON WARFARE AND HUMAN EXPERIMENTATION. 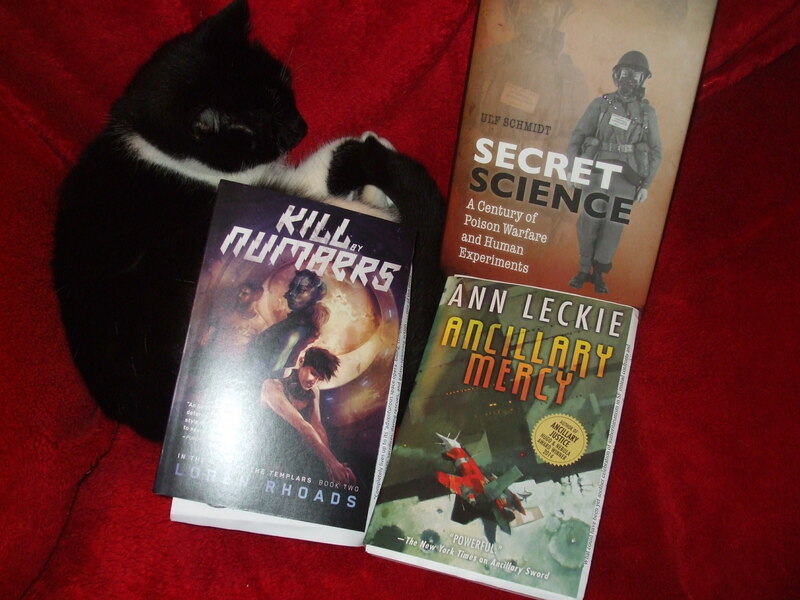 Courtesy of Talos Books, that’s Loren Rhoads’ KILL BY NUMBERS (I want to read this trilogy, I do, I NEED MORE TIME). And courtesy of Orbit Books, we have Ann Leckie’s amazing ANCILLARY MERCY. Courtesy – surprisingly! 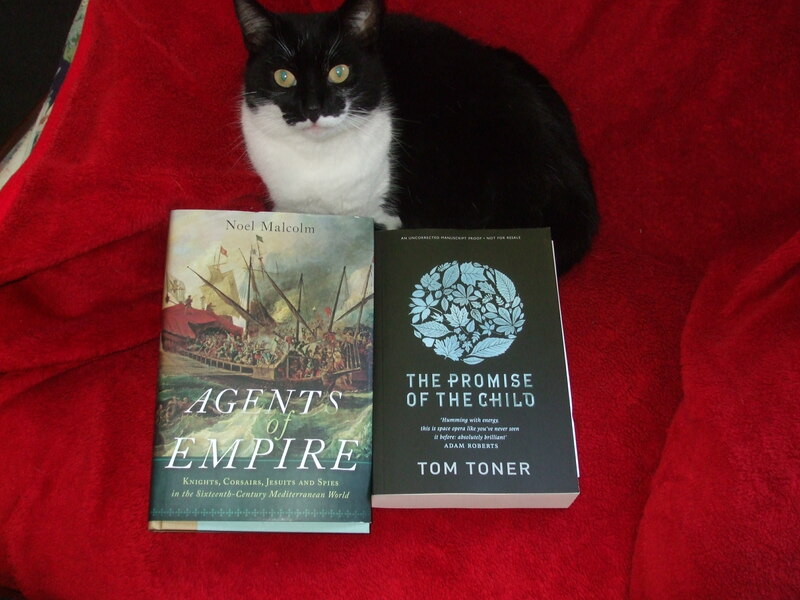 – of Oxford University Press, Noel Malcolm’s AGENTS OF EMPIRE. Courtesy of Gollancz, Tom Toner’s THE PROMISE OF THE CHILD. It’s not just my terrible camerawork: the lettering really *is* like that. With bonus guest star Neighbour Cat. 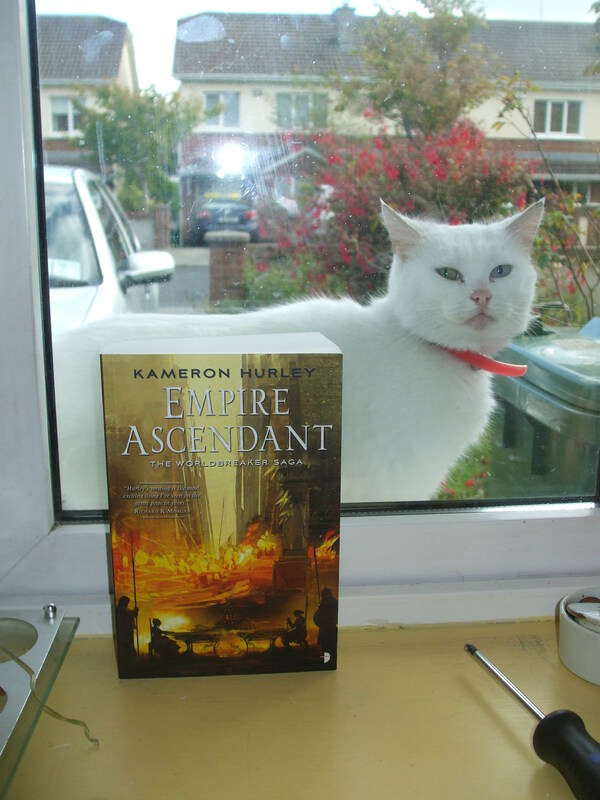 Kameron Hurley’s THE EMPIRE ASCENDANT, courtesy of Angry Robot Books. 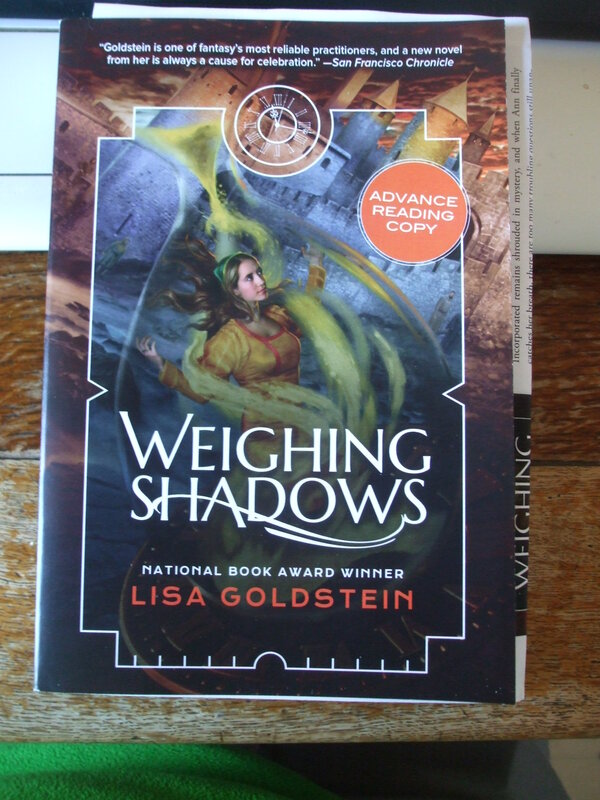 That’s WEIGHING SHADOWS, by Lisa Goldstein. 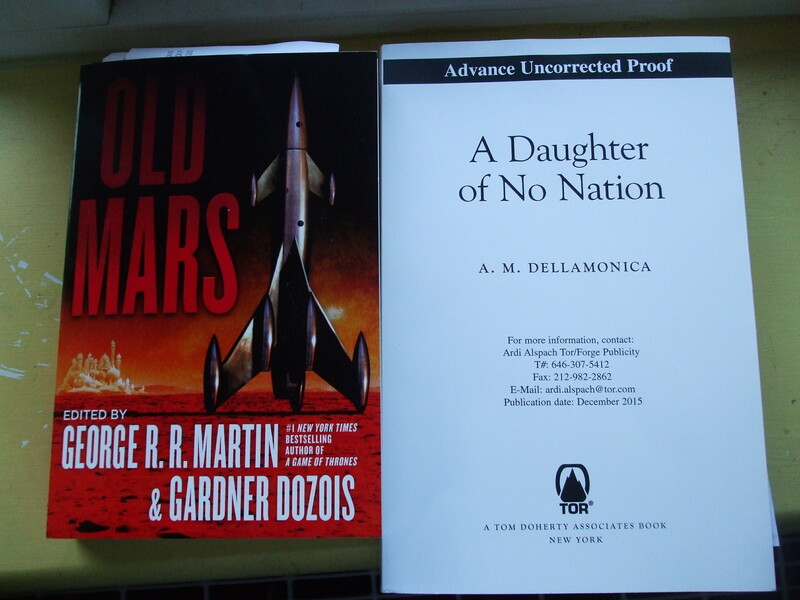 OLD MARS, edited by George RR Martin and Gardner Dozois, and A DAUGHTER OF NO NATION, by A.M. Dellamonica. Here’s OLD MARS, edited by George R.R. Martin and Gardner Dozois, and A.M. Dellamonica’s A DAUGHTER OF NO NATION. 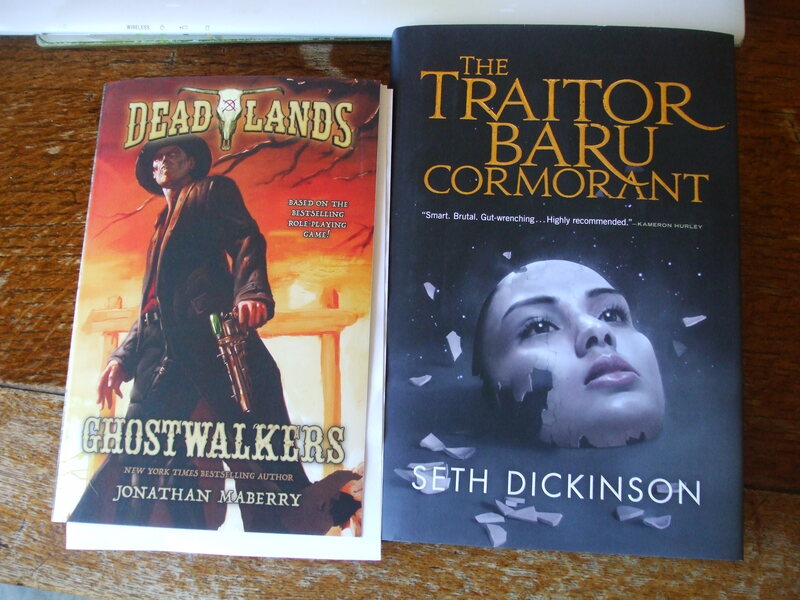 Jonathan Maberry’s DEADLANDS: GHOSTWALKERS, and THE TRAITOR BARU CORMORANT by Seth Dickinson. 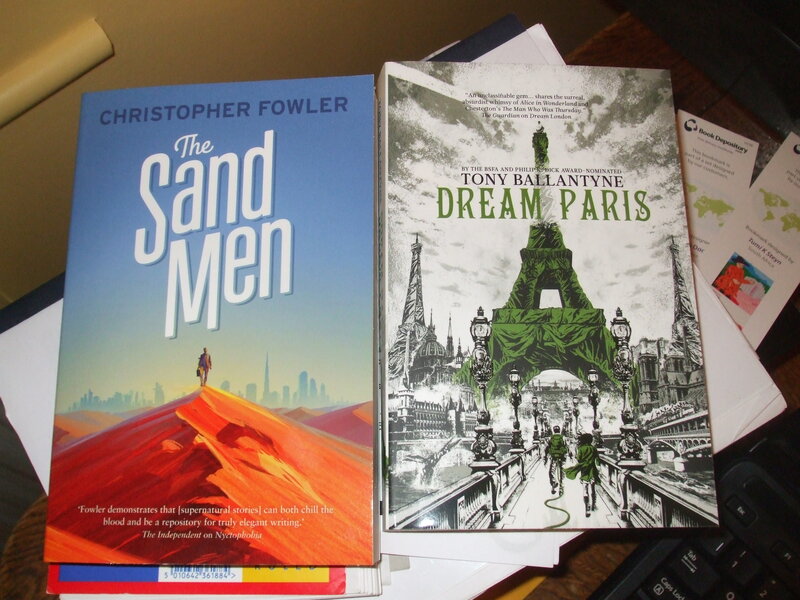 Christopher Fowler, THE SAND MEN, and Tony Ballantyne, DREAM PARIS, both courtesy of Solaris. DREAM PARIS looks interesting enough to make me wonder about the first book in the series, DREAM LONDON. 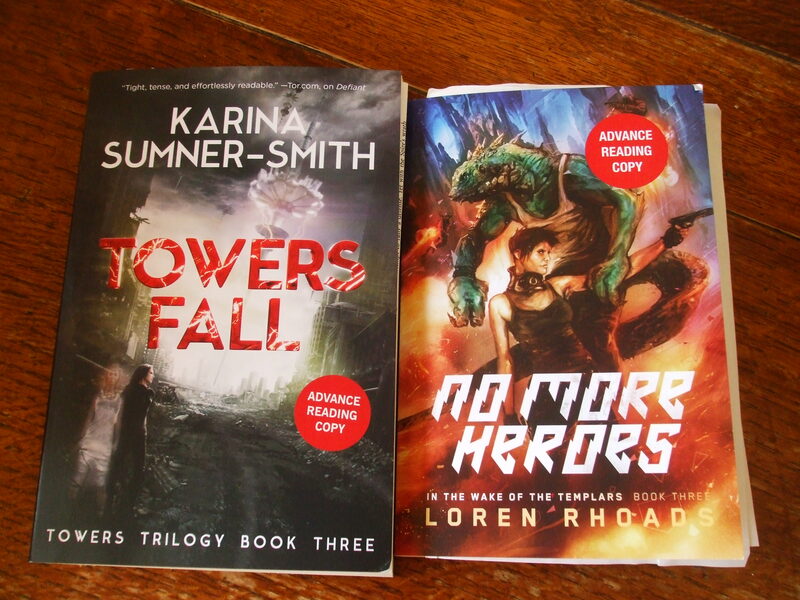 Karina Sumner-Smith’s TOWERS FALL, and Loren Rhoads’ NO MORE HEROES. I am distressingly ill. There are a distressing large number of deadlines around about. There is also a distressingly large quantity of books, and none of them are the next lot of C.J. Cherryh’s FOREIGNER series, or the next book by Laurie R. King, which is all I really want to read right now… sadly. 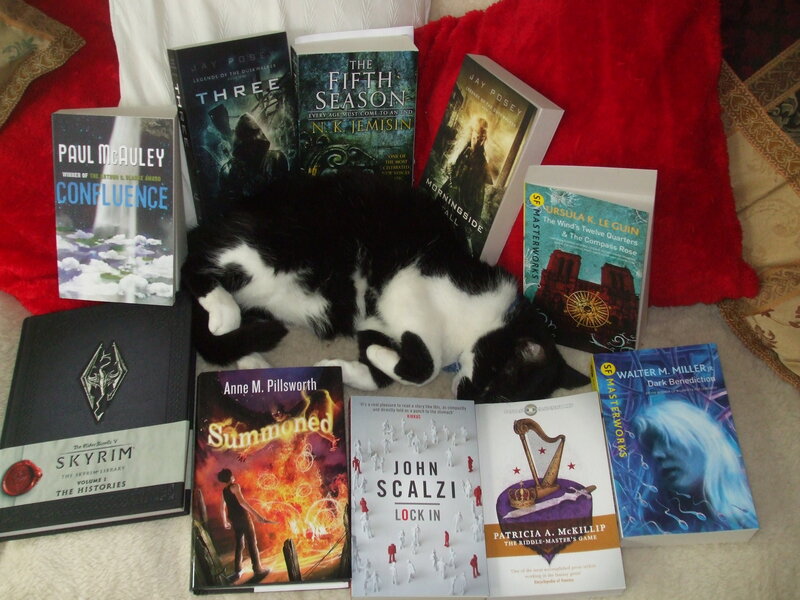 Books, with tolerant sleepy cat. Victor Milan’s THE DINOSAUR LORDS, D.B. 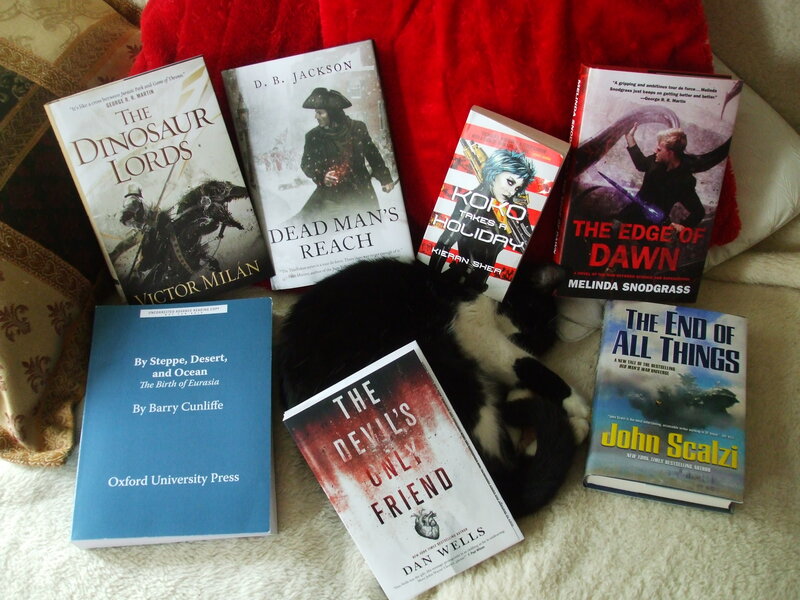 Jackson’s DEAD MAN’S REACH, Melinda Snodgrass’s EDGE OF DAWN, John Scalzi’s THE END OF ALL THINGS, Dan Wells’ THE DEVIL’S ONLY FRIEND, Kieran Shea’s KOKO TAKES A HOLIDAY, and Barry Cunliffe’s epic BY STEPPE, DESERT, AND OCEAN: THE MAKING OF EURASIA. The cat is briefly tolerant. NK Jemisin, THE FIFTH SEASON; Jay Posey, THREE and MORNINGSIDE FALL; Ursula K. LeGuin, THE WINDS TWELVE QUARTERS & THE COMPASS ROSE; Walter M. Miller Jr., DARK BENEDICTIONS; Patricia A. McKillip, The RIDDLE-MASTER’S GAME; John Scalzi, LOCK IN; Anne M. Pillsworth, SUMMONED; Bethesda Software, SKYRIM: THE HISTORIES; and Paul McAuley, CONFLUENCE. 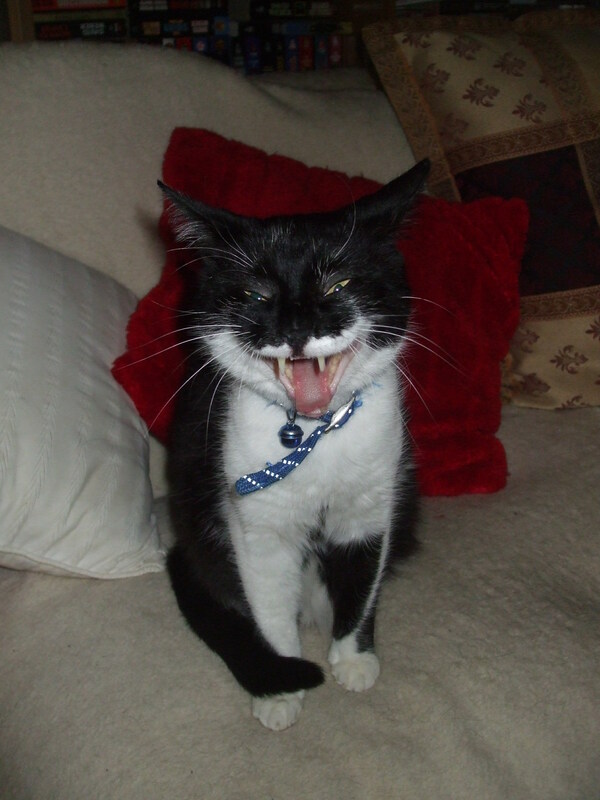 The cat awakes, and disapproves. 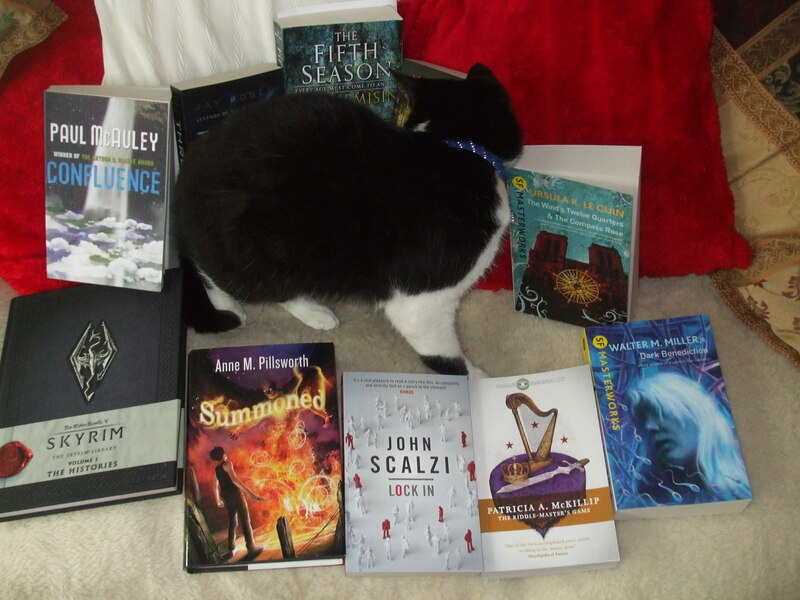 Posted in SFF	| Tagged Anne M. Pillsworth, books, cat, cats, Jay Posey, John Scalzi, N.K. Jemisin, Patricia McKillip, Paul McAuley, pictures, Skyrim, The Elder Scrolls IV, Walter M. Miller Jr.
I’ve been quiet around here this week. Even quieter than usual. That’s because I a)got a new bike (WHEEEEEEE GO FAST PEDAL FASTER) and b)realised the deadline for my thesis corrections is… much closer than it used to be. Quietness will probably continue until September. Unless I change my mind, of course. And here are the very shiny books. 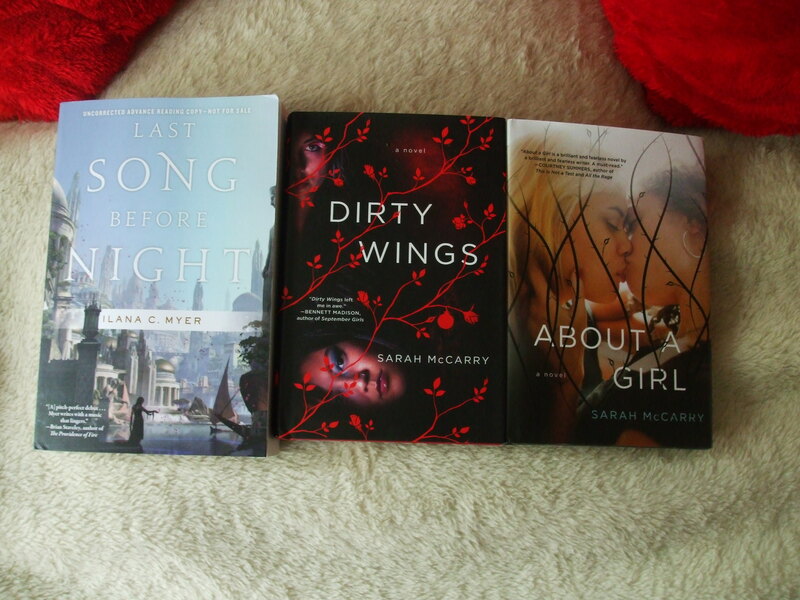 Sarah McCarry’s DIRTY WINGS and ABOUT A GIRL, which I intend to write a column on; and Ilana C. Myer’s LAST SONG BEFORE NIGHT, which I am supposed to review for Tor.com. BOOKS! Seven? Seven stars, and seven stones, and one white tree. I confess myself astonished: Oxford University Press appears to have sent me copies of three volumes of poetry: Eleanor Rees’ BLOOD CHILD, Sarah Corbett’s AND SHE WAS, and Mona Arshi’s SMALL HANDS. 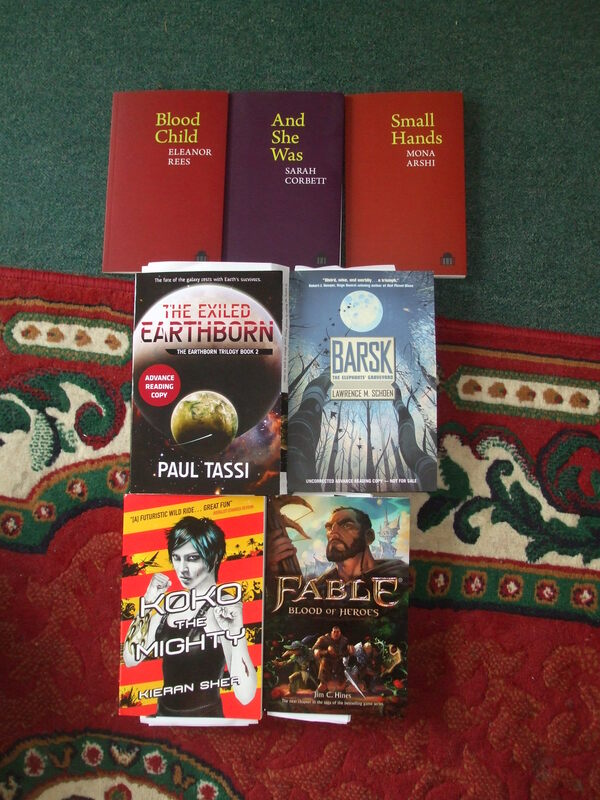 From Titan Books, Jim C. Hines’ FABLE: BLOOD OF HEROES and Kieran Shea’s KOKO THE MIGHTY. From Talos Books, Paul Tassi’s THE EXILED EARTHBORN. From Tor Books, Lawrence M. Schoen’s BARSK: THE ELEPHANTS’ GRAVEYARD. So I wrote an email chasing some of these (because I am supposed to review some of them for deadlines) only to find them arriving the next day. EMBARRASS ME POST WHY DON’T YOU. 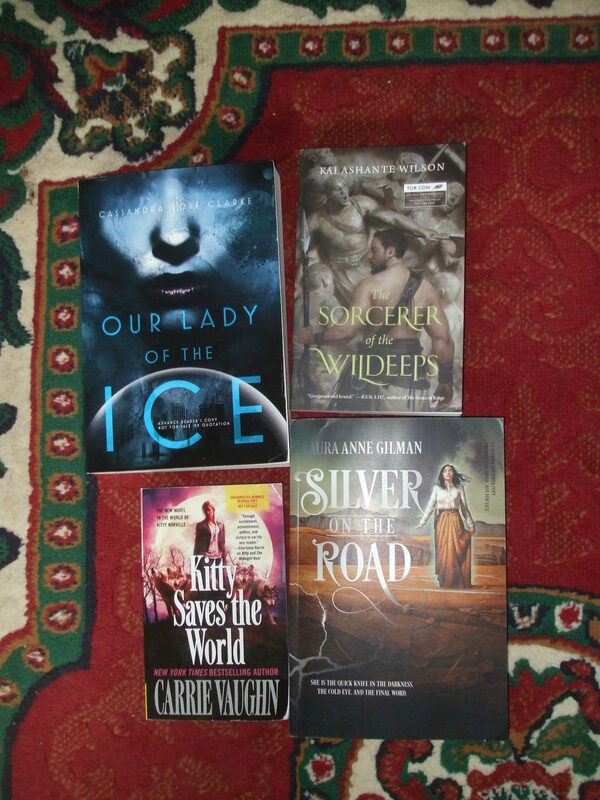 That’s Cassandra Rose Clarke’s OUR LADY OF THE ICE (Saga Press), Laura Anne Gilman’s SILVER ON THE ROAD (Saga Press), Kai Ashante Wilson’s SORCERER OF THE WILDEEPS (Tor.com Publishing), and Carrie Vaughn’s KITTY SAVES THE WORLD (Tor Books). 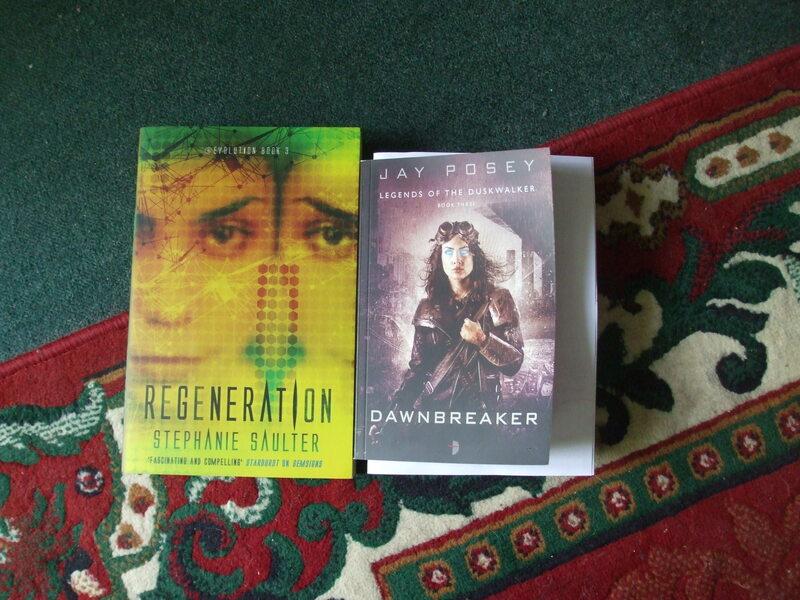 And this is Stephanie Saulter’s REGENERATION (Jo Fletcher Books) and Jay Posey’s DAWNBREAKER (Angry Robot). 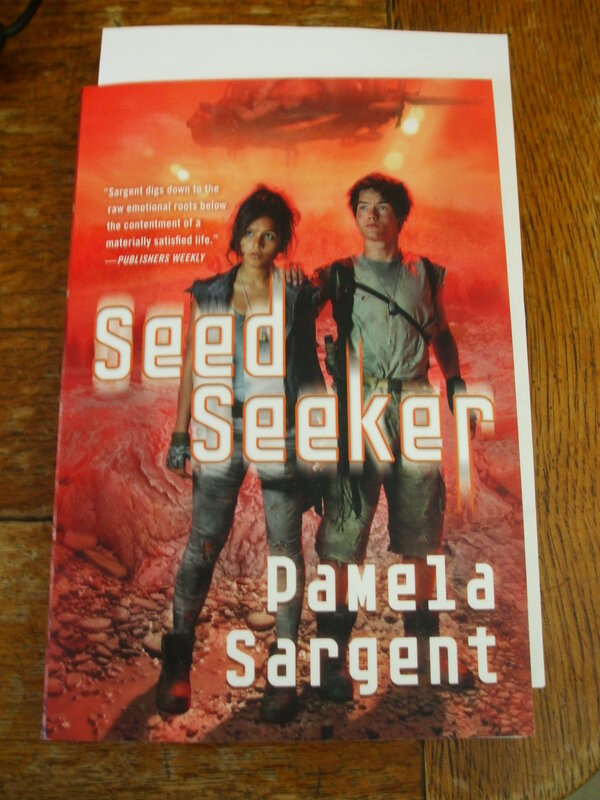 Although I don’t know why anyone would send me the third book in a trilogy where I haven’t ever seen the first two… still, it has a pretty cover? 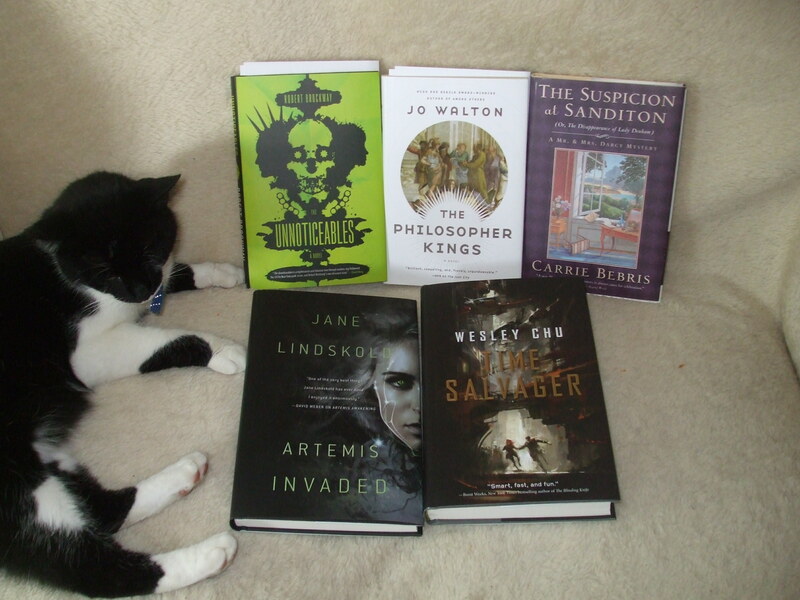 Catmonster supervises recently arrived review copies. Courtesy of Tor Books: Jo Walton’s THE PHILOSOPHER KINGS, Wesley Chu’s TIME SALVAGER, Robert Brockway’s THE UNNOTICEABLES, Carrie Bebris’ THE SUSPICION AT SANDITON, and Jane Lindskold’s ARTEMIS INVADED. What do you mean, I can’t have them back?